The 2019 incentive program begins on January 1, 2019. The HealthySteps to Wellness Program gives you the freedom to design your own path to a healthier lifestyle. In addition to free and discounted Wellness Tools, you also have the ability to earn a wellness incentive of $100 to $1,000! Earn 250 points and receive either a $250 (employee-only) or $500 (employee + one or more covered dependent) incentive. *Non-Represented and SEIU employees enrolled in a hospital-sponsored medical plan, including CRONA members enrolled in a Stanford Health Care Alliance (SHCA) Plan are eligible to earn wellness incentives. Benefit-eligible employees enrolled in a hospital-sponsored medical plan can earn up to $500 during the incentive period. Benefit-eligible employees with dependents enrolled in a hospital-sponsored medical plan can earn up to $1,000 during the incentive period. **Tobacco users can complete the the Tobacco: Kick It! (Beacon Health Options). Please note: New employees are eligible to participate 30 days after hire date. Dependents do not need to enroll in the program. How does the incentive payment work? All points must be earned before incentive is paid. Incentives are deposited into your Health Equity Health Savings Account (HSA) if enrolled in the Aetna Choice POS II Plan, or Health Reimbursement Account (HRA) if enrolled in the Stanford Health Care Alliance (SHCA) or Kaiser Permanente HMO plans. If enrolled in the Aetna Choice POS II plan and are not eligible for the HSA, all incentives are deposited into an HRA. Funds in your Health Equity HSA or HRA may be used to pay for IRS-qualified health care expenses. Your incentive will be located in your Health Equity Account after the “deposited by” date listed above. *Your incentive will be based on your medical enrollment status (employee-only or employee + 1 or more dependent(s) as of the last day of each quarter. To earn your incentive, you must be enrolled in a hospital-sponsored medical plan and be an active employee at the time funds are deposited, or the funds will be forfeited. Your 2019 Healthy Steps incentive program begins on January 1 and ends on September 30. Login to CaféWell by clicking the red “Login to Program” button on the right side of this page and begin creating your own personal wellness itinerary. New to the program? You’ll need to create a CaféWell account. You will be asked to create a username, password, and verify your eligibility by providing some required information. Learn more. After creating your account, you’ll have the opportunity to view a short tutorial to help you become familiar with the new platform. You can also register through the CaféWell mobile app. Learn more. You can get started January 1, 2019! Click on the red “Login to Program” button on the right side of this page. Start with the Health Assessment as it is the gateway to better health – and incentives. Please note: New employees are eligible to participate 30 days after hire date. Dependents do not need to enroll in the program. 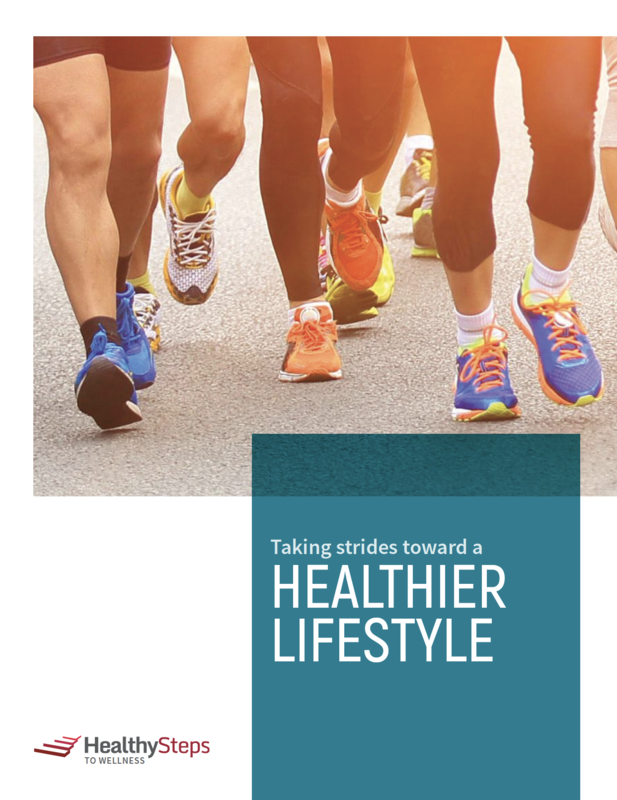 Stride towards a healthier you.